Hatteland Display, the market-leading marine display and panel computer manufacturer, was presented with the "Most Improved Supplier Award 2007" by Sperry Marine, a business unit of Northrop Grumman (NYSE: NOC). 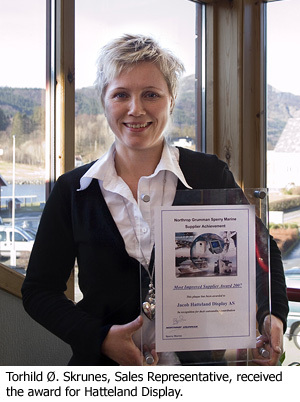 The award was presented at Sperry Marine's Supplier Conference in New Malden, England on 6 February 2008 by Sperry Marine's operations manager for Europe, Chris Bruce. It reflected the extensive manufacturing and logistical initiatives that Hatteland Display introduced throughout 2007 in order to meet current and future demand for its market-leading display products. "We noticed a definite improvement in Hatteland Display's ability to meet our demand for displays throughout the year," commented Chris. "We count on our major suppliers to provide us with quality products and good service and Hatteland Display achieved this, so we are delighted to show our thanks by naming them our most-improved supplier." Although it was 'business as usual', 2007 was definitely a year of change for Hatteland Display. The company was bought by the Norwegian private equity investor Ferd Private Equity Fund II (FPEF) in March 2007 and, following an initial 100-day program, several key production initiatives were started in order to secure strong, long-term supply chain and manufacturing logistics. In addition to expanding its quality control department in June 2007, the company also completed an advanced line manufacturing facility that greatly increased its production capacity at its Nedre Vats, Norway facility. Several key appointments were also made during the latter half of the year including Terje Akerholt to director of the commercial division and David Hawthorne to general manager USA. "We're delighted that Sperry Marine has recognised our efforts in expanding our manufacturing and supply capacity over the last year," commented Akerholt, who was at the conference to accept the award. "We are committed to ensuring that we can meet the delivery requirements of our systems integrator customers and believe that our investment throughout 2007 proves this. As the market leader in the marine display and computers field we are now more than ready to meet the increasing demand for our products that we experience year-on-year."